Latest Partisan Flashpoint: GOP Benghazi Fundraising : It's All Politics Raising money after tragedy isn't new. But the latest dust-up comes as both parties try to energize their grass-roots supporters with control of Capitol Hill in the balance. 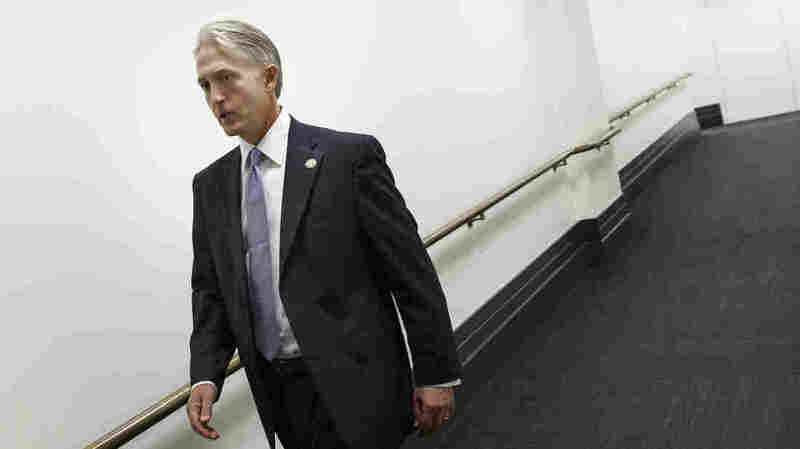 Rep. Trey Gowdy, R-S.C., leaves a closed-door Republican strategy meeting at the U.S. Capitol on Wednesday. He will head the select House committee on Benghazi. The name "Benghazi" used to just inflame conservatives. Now it is demonstrating its power to outrage progressives as well, though for different reasons. To be precise, Democrats are angered not just by the House GOP's creation of a special committee to probe the 2012 terrorist attacks in Libya that left four Americans dead but by Republican fundraising in connection with the Benghazi probe. Raising money in the wake of tragedy certainly isn't new; both parties have engaged in it to greater or lesser degrees. But the latest dust-up arrives during a 2014 midterm election year in which both parties are trying to energize their respective voter bases and control of Congress hangs in the balance. It also comes with the 2016 presidential race fast approaching, with Republicans doing what they can to dent the Democratic front-runner, former Secretary of State Hillary Clinton, and Democrats trying to protect her. Republican leaders understand that the idea of Benghazi-linked fundraising is distasteful to many voters. For instance, Speaker John Boehner was asked several times at a news conference Thursday about the National Republican Congressional Committee using the probe to raise money. Three times he declined to answer directly, instead opting for: "Our focus is on getting the answers to those families who lost their loved ones, period," or a variation of that. "The Obama administration has not been honest with the American people with regards to Benghazi, and if Nancy Pelosi becomes Speaker the American people will never know the truth. Our goal is to hold Democrats in Congress accountable who vote against creating the select committee on Benghazi and who continue to try to sweep this controversy under the rug." Not exactly on point, but even after a follow-up question, that's as far as he would go. 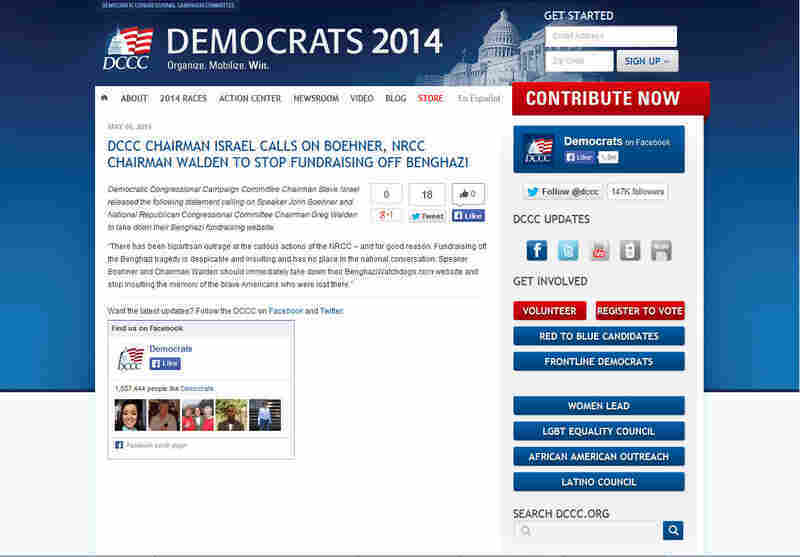 Then he pointed to a Daily Caller story that argued Democrats were also fundraising off Benghazi. 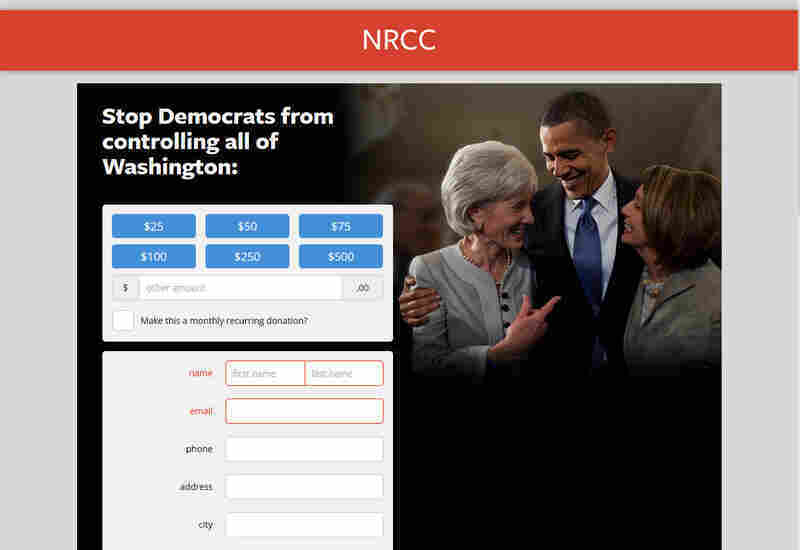 The story points to a screen shot — similar to the one below — that shows a news release on the Democratic Congressional Campaign Committee website on the same page with a big red "Contribute Now" button in the right sidebar. There's a significant difference, however, between what the Democrats and the Republicans are doing. 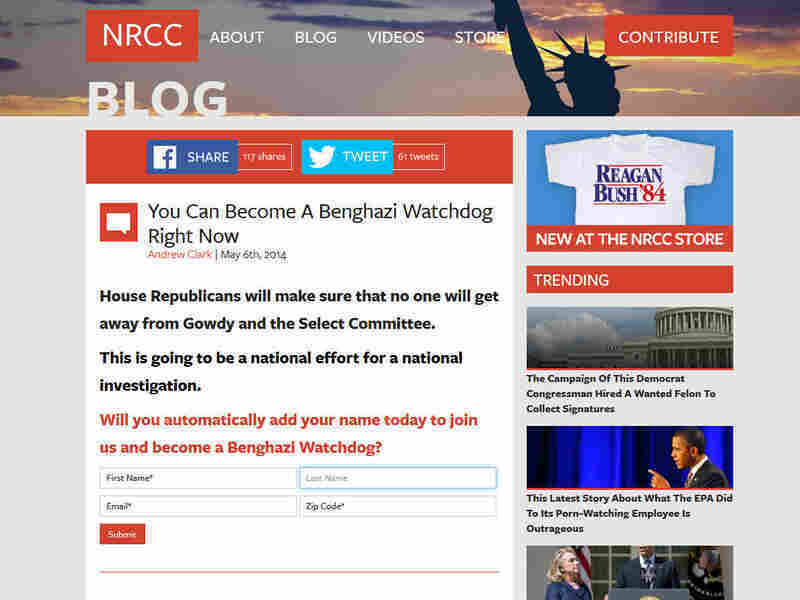 On the NRCC's BengaziWatchdogs.com site, however, a visitor is encouraged to provide an email address and other contact information. When you click submit, you're guided to the fundraising page below. Democrats have collected emails, ZIP codes and money after tragedies too. The NRCC pointed to a Boston Globe story, which reported that after the Boston Marathon bombings, the Democratic National Committee urged people to thank Boston's responders in a way that allowed the DNC to harvest names, email addresses and ZIP codes that could later be used for future campaign purposes. Democrats, meanwhile, were just as helpful in pointing journalists to Republicans who have objected to GOP fundraising tied to the Benghazi tragedy. The September 2012 attacks organized by extremists killed four Americans, including U.S. Ambassador Chris Stevens. While there's no direct evidence yet of Democrats using Benghazi to raise campaign money, their outrage over GOP fundraising off the tragedy has produced the kind of emotion in Democrats that is often useful for fundraising.